CAVITE PRIME , Residential, Commercial Subdivision has a size estimates at around 5,100 square meters prime development with a chic fusion of International and Modern architecture inspired theme master planned Community. CAVITE PRIME is divided into 20 units of commercial town houses or home store and 26 units of residential town houses, that offers a lifestyle of a unique blend of city and countryside living. CAVITE PRIME, a residential, commercial subdivision aims to provide modern townhome living at an affordable cost. This new Amrak Land Development & Construction Incorporated venture is strategically placed at Centennial Road, Brgy. Batong Dalig, Kawit, Cavite. 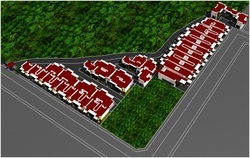 The modern townhomes is the first and only exclusive, residential, commercial subdivision in the area. CAVITE PRIME , conceived to provide an excellent residential and commercial base, right smack in the middle of shopping centers, malls, restaurants, schools, hospitals and churches. Major business hubs and other commercial establishments are within its boundaries. Everything you need is within reach. CAVITE PRIME provides every home buyer with the most innovative yet practical solutions to a family’s changing needs, whether one aspires for an extended family home, a start-up townhome, or a long-term home investment. THE CAVITE PRIME, will not only be built, it will be GROWN… It is the first residential commercial subdivision to rise at Centennial Road, at the heart of Kawit in Cavite, right across Kawit Municipal Hall. Designed with features influenced by modern technology and cutting – edge architecture. A smart concept for a combinable hyper sized residential and commercial units at an affordable price package. With its prime location in the heart of Kawit in Cavite, future CAVITE PRIME residents can enjoy the nearby location entertainment and commercial centers. Opportunity of live and earn by its location potential right smack in the middle of commercial area. is the price of the units. to allow even the middle class to acquire real estate properties. in this newest townhomes development in kawit, Cavite.